As a counter to the ever spreading influence of the Magic Council and their petty excuse for a police force, the Rune Knights. 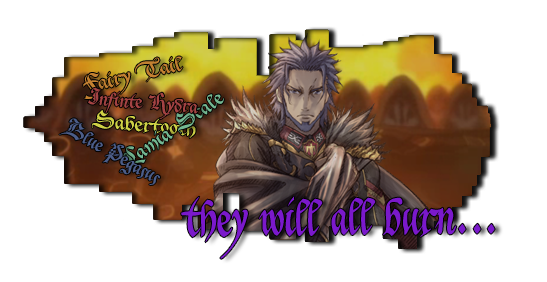 The Azeron Alliance, which is a coalition between the top three dark guilds in Fiore. Has put out an assassination contract on one of their leading commanders. Namely Hendrick Kennel. Usually this man would be untouchable since he always stays safe behind his walls and towers at the Council headquarters in Crocus. But not anymore, because of one of our bureaucrat operatives at the Council. We've have managed to have Hendrick to be the spokesperson at the opening of a new Rune Knight outpost at one of Fiore's most outer villages. Giving us the opportunity to show these pesky knights that we don't tolerate them increasing their influence, not even when it is at some backwater village in the outer regions. The contract itself is simple, Kill Hendrick the moment he is in the middle of his speech. Yes, we know it will be dull to listen to the first half of it, but we believe that moment is the best choice to assassinate him and send a proper message. We don't care how you do it, you can walk up to him on the stage, or try some more creative approach. You can even rig the entire platform with explosive. As long as it is done. We do suspect the trick lies in escaping the place, even though it isn't knights headquarters the place will probably still be packed with them. They will surely hinder you the moment you try to flee the town. Upon escaping the vicinity you will almost definitely encounter the young aspiring lad who are dreaming of a world where justice will prevail. But don't worry, even though they will try to stop you they are still trainees. And will be without a doubt easily dispatched my someone of your talents. - These are weaklings that take a single B rank to bring down. They only do D rank damage. Soldiers armed with magical weaponry, shields that deflect any D rank spell. And weapons that deal extra damage against mages. With every hit they make your magical power will be drained for 5%. - These can be brought down by two B ranks and dish out C rank damage to boot. Even among the Rune Knights do you have those with magical abilities. Mages who have a firm belief in the justice system. And are somehow obsessed with bringing down anyone who falls of the path of righteousness. These come in all shapes and sizes and their magic is entirely up to you. - Takes a full six B ranks to bring down and they dish out B rank damage with their spells. As Dahau spied from behind one of the merlons at the scene beneath him, he saw a large gathering of various Rune Knights. All coming together around a center stage, on which a prominent member of the Knights stood and relentlessly talked on about his time on the force. While the crowd held a variety of knights, from simple trainees to strong looking mages, the man in the center appeared far more flamboyant than his colleagues. He wore a ceremonial uniform on which he presented every medal he'd ever earned while dragging behind him a long cape woven out of the finer tanning materials. His blond hair was combed backward and to finish it all off, he had a rather arrogant smug. This man was Hendrick Kennel, the Rune Knight Commander of this region and their target. Dahau looked over at his companion, with his slender build, long emerald hair and his happy go lucky attitude many would consider him an oddball. The hard truth, however, was that this man was a powerful dark mage in the servitude of the guild Nightmare, just like Dahau himself. 'What shall we do?' he inquired 'We could take him out quietly from here... or we could make our presence known rather explosively. Either way, he'll die.' It was obvious which method Dahau preferred, and he knew that Baird would prefer it that way too. After all the two them were here to send a message and only killing the commander simply wouldn't cut it. No, if they really wanted to introduce the world to Nightmare they had to take drastic and more catastrophic methods. Just as their master ordered them to do. The winds of change were blowing through these horrid halls, no longer were the various mages and soldiers at each others throat. But now they had found a new purpose, a new master had risen through the ranks, using the chaos as a ladder to climb on and had assumed command. An extraordinary feat if Dahau said so himself, still he had yet to meet this enigmatic new leader who hadn't shown herself before it's members. However, that didn't stop her to set a new course, one that every member of the guild could get behind. Which was setting their own mark upon the world by taking out the scourge that plagued every dark guild, namely the Rune Knights. These self-righteous knights had sworn to protect the world against evildoers and therefore stood in the way of Nightmare's imminent advance.